Santander Universities was born as an idea from our Group Chairman, Emilio Botin. It’s at the core of Santander’s philanthropic activity and aims at providing financial support to our partner universities by way of scholarships and travel awards and underpinned by an objective to increase entrepreneurship values and activities in the UK. We work with lots of universities, using the bank’s resources to support them in all aspects of academia and employability. The University of the West of England (UWE) is an outstanding university that has been very accommodating from day one. They understand that it’s crucial for universities to engage with business – whether small, medium (SME) or large corporations. As much as universities are world class at providing academic training, UWE understand that they need to tie that into employability. They are doing a lot to push that agenda which is brilliant for us. Part of our funding is allocated to supporting students who have got business ideas. UWE gets them to pitch their ideas to a panel that includes one of our senior branch partners. It gets students asking, what do I need to be thinking about if I want to start a business? That was really positive. The careers service has also engaged with us a lot on our SME internship programme. As part of our agreement with UWE we’ve given them 15 paid three-month internships funded by Santander. This is matched by the university or a local SME and is designed to get the university engaged with local SMEs and to help students get a work placement designed to increase their skills in the workplace. As a global business we recognise that investment in the higher education sector can only be a positive thing. It’s driving increased global mobility. Our priorities are giving students the opportunity to have an international experience and working with universities on the entrepreneurship agenda – a successful economy relies on new ideas and new businesses to create jobs, wealth and opportunity. I personally work with a large number of partners and UWE is right up there at the top. UWE is extremely visionary; the University is very focused on developing excellent collaborative relationships with business, at all levels – corporate business to SMEs. The Vice Chancellor leads on that and he is very committed to developing these relationships to benefit the student experience and tie in very positively to employment skills and opportunities. Everyone we’ve had any contact with at the University has been extremely positive and receptive to having this collaborative approach to working together. 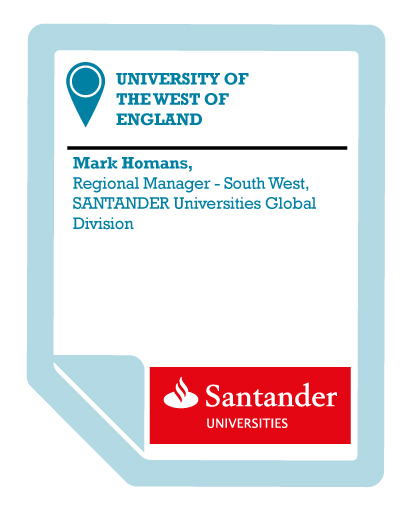 So far the relationship between UWE and Santander Universities could not have been more rewarding for the University and the bank.